We'd say we could relax a bit now, except for the fact that when we watch Homeland it tends to be with our breath held due to all the tension, not knowing who'll die next or if Carrie might suddenly throw a gurn at us. It's just that, seven episodes in to series two, it's a relief to see that the previously tedious Dana and her politician's son boyfriend sub-plot finally start to make sense - rather than, as up to now, it just feeling like clips dropped in from an episode of a dreary US teen drama, as if Homeland somehow needed padding to fill its hour-long slot. But, just as Saul says (to the imprisoned terrorist Aileen shortly before she kills herself using glass from his spectacles he'd carelessly left with her while out he dashed in pursuit of a suspect she'd deliberately wrongly identified) - 'trust me'. And as much as we think Saul had to have that out-of-character slip up just to help the plot along a bit - and Aileen, you really didn't need to kill yourself, you would have got that window you wanted - in a programme that's all about double-crossing, secret plots, and Carrie and Brody's on/off relationship (but with a twist, 'obvs'), the world in Homeland is one where no-one can be trusted. So you can't blame us for fearing for the Dana/boyfriend subplot as a possible (but fortunately unfounded) symptom of the show's early decline, but having said that, maybe we should have been more trusting of the show's producers and writers in the first place. We're now seeing how it was actually a cunning 'plot device' to highlight how honesty and being a good parent comes second to politics, 'national security' and foiling major terror plots. Depending on who you believe, they have either signed up to Homeland for five or seven years. So far the show's enjoyed surprising us, and has been brilliant at it - that hotel room confrontation between Carrie and Brody so early on in this series, where she arrests him as a terrorist then later plays him back his pre-suicide video message, felt like a shock. Other shows might have saved that sort of moment for an end-of-series cliffhanger, but, and as noted by the show's producer in an interesting article here, it got Carrie and Brody together, and enabled the plot to speed off into a new direction with Brody recruited as a double agent and forced to tell more lies to everyone to help the bluff along. And a chance for Carrie to gurn a bit more. But, amid various talk of Brody actor Damian Lewis having signed up to the show for five years, or Carrie actress Clare Danes having signed up for seven - seven! - there must be a long term plan for the series and the characters, even if the producers might be trying hard to ignore that the story might naturally come to an end way before that. How many more double-double crossing can there be? How much more strife can Jess take? And shouldn't Saul go off to Mumbai and try and save his marriage? The answers, we'd bet, are, specifically: plenty; lots more unfortunately but she might start up things with Mike again which would be nice for her but not for very many others; and yes, but he won't. 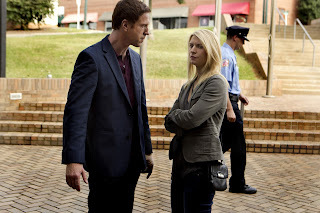 - Homeland series 1 episode 2: Who can we trust, and is that Lynne doomed or what? The Hour series 2: Anyone fancy a cigarette?